2. Real Slow’s “Drowned Out” is a sonic smoke session designed to take the edge off that throbbing in your frontal lobe. 3. You may have never heard of Kimyan Law, but this Austrian producer’s mesmerizing beat work is absolutely otherworldly. Ambient and entrancing, “Copperclock” will help you ease into your lazy Sunday. 4. Macksimus “Don’t Ever” pairs sax and soul singing into a track that plays well on the dance floor or in a pair of headphones. 5. 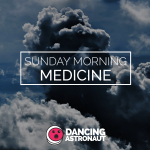 An old favorite, Karma Kid’s “Feels Like I’m on Fire” was Sunday Morning Medicine worthy without Charles Murdoch’s touch. Now its tech house perfection combined with the Kid’s soothing touch.